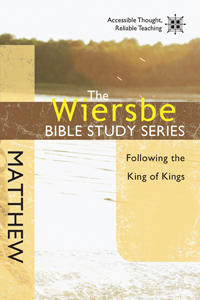 Here is another volume in Wiersbe’s excellent Bible Study Series. This one is on the gospel of Matthew. The Wiersbe Bible Study Series explores timeless wisdom found in God’s Word. Based on Dr. Warren W. Wiersbe’s popular “BE” series, each study provides topical, relevant insights from selected books of the Bible. Ideal for both individuals and small groups, this ten-week study features excerpted commentary from Be Loyal, engaging questions, and practical applications, all designed to help you connect God’s Word with your life.